Years ago I attempted raw vegan cooking. I always feel great when I eat it and I find I have more calm and focus, although I still believe in combining my families’ diets with a combination of raw vegan and carnivorous dishes in the Weston Price tradition. Well light years have passed since I made my first raw vegan attempt, and recipes have become simpler, easier to prepare and more delicious. All you really need is a Vita Mix and a decent food dehydrator, some nuts and veggies, a good recipe and a sense of adventure. 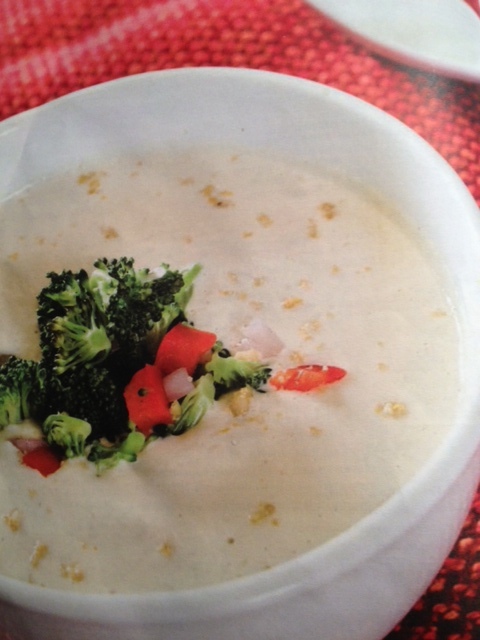 Here’s one of my latest favs, raw vegan broccoli soup, courtesy of The Present Moment Cookbook. Another great website if you want free delicious recipes is www.therawtarian.com. Drain and rinse cashews well. In a vita mix, blend base ingredients to smooth consistency. Pour into bowls, add broccoli (and fresh chopped tomatoes if desired) into bowls. Serve. It is! And it keeps in the refrigerator so you can make a batch and keep it for a few days. Of course it’s so delicious, it may get gobbled up before then!